Zoe got a tour of the lower 9th neighborhood from a local off-duty police officer. This was the poor area on the wrong side of the canal were the levees broke and let a huge flood in very fast. She let me borrow a few of her pictures. Apparently it went on like this for over a mile. It's going to take a while to rebuild this. > It's going to take a while to rebuild this. Should the lower ninth be rebuilt? Hastert was wrong when he questioned whether New Orleans should be rebuilt, but I think that it's worth asking whether there should continue be a lower ninth ward. It appears to me that this is working against nature -- the Mississippi drains a substantial part of a continent. The marshland south of New Orleans should be allowed to replenish (it has been reported that at present an area the size of Manhattan is lost to the Gulf of Mexico every ten months due to the interference of man-made structures -- the levies, canals, etc.) Instead, the neighborhoods of the lower ninth ward should be moved to higher ground away from the river, and the land in the lower ninth should revert to its natural state -- marshland, grassland, etc., to be part of the buffer that absorbs the yearly flooding from the river and hurricanes. None of this appears to be given any consideration -- work continues on rebuilding the levies and making them better than they were before. In addition to the expensive of rebuilding all of the housing in situ, much of the land needs to be de-toxified before people can live there safely. Former President Clinton was on C-SPAN recently. He proposed that we make New Orleans the first "green" city. Unfortunately, he didn't elaborate on what he meant by this. This is an election year, and the closest one to when Katrina struck, so there's a (small?) chance of getting a good plan funded, but after this year, it's unlikely that anything will happen before 2009, unless Bush leaves office before then. Jaun Cole predicts that the poor neighbourhoods of New Orleans will never be rebuilt (at least as long as the Repubs are in power) because they vote for Democrats. Given what we know now about New Orleans, the rate of sinking, how the entire landmass is sliding slowly off the continental shelf, I do not believe New Orleans should be rebuilt at all. But hey, rational analysis is not the strongpoint of our species so expect a few trillion to get wasted on New Orleans as it gets rebuilt two or three times over the next 50 years. If the world is at or near the peak in production of cheap oil, then isn't it clear that there won't be the money for multiple rebuildings of New Orleans? In fact, it's arguable that there already isn't the money for the combination of 1) multiple tax cuts, 2) an invasion, occupation, and rebuilding of Iraq, and 3) rebuilding of the Gulf coast. Don't worry, they have already more or less axed one of those, the rebuilding of Iraq. well, ok, just so long as they don't roll back those tax cuts. I have been following the New Orleans story with the issue of energy lingering in the background. My conclusion shortly after the hurricane and now is this city is not coming back. Not in it's previous form and probably nothing more than a shell of itself. There are too many geological strikes against the region. The damage in the lower Ninth Ward was caused in large measure, by the wall of water that came from the industrial canal when this barge went through the floodwall. 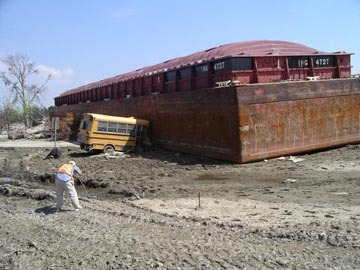 Notice that as the floodwater level dropped, the barge sat down on the bus. You can see the damage effect on the floodwall from the way in which the steel piling that formed the wall has been flattened and pushed out into the Ninth Ward. (The original position is where the white stone levee has been placed to the left of the picture). We drove from that wall directly away from it and found that houses were moved off their foundations for more than ten blocks. My understanding from Zoe is that there's three breaches in the levees into the lower 9th. One is clearly caused by the barge (of which she has amazing pictures of the crushed houses under the other side of it from where it looks like you took your shot), but the reasons for the other two are unclear (at least to her). Some activists she spoke to expressed conspiracy theories that the levees were deliberately breached with explosives as a preemptive measure to drain water away from the business center of NO. Did you see any other breaches, or check for them? More cheerfully, we were in the French quarter this afternoon, which is pretty much business as usual - even more so than the garden district - 90%+ of businesses open. I'll add some pictures from it as an update to this story after I get home (we're about to leave for the airport). The team I was on visited all the breaches in NOLA and a fair number of those down the delta. In most cases it was clear that the walls were first overtopped (as they were by the barge) this softened the ground and the pressure then pushed the pilings over - because of time I was only at the barge failure on the Industrial Canal, and at the 17th Street failure (shown here), before most of the wall was covered with the new temporary levee. This latter was still leaking a fair amount of water while we were there, and is the one where there was dredging on the canal side before the Hurricane. 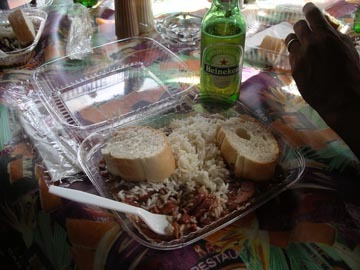 You had better luck with food than we did, in the French Quarter they had only enough electricity to either wash the dishes or keep the beer cold - guess what? Glad to hear that the old place is coming back! PBS's "Nova" attempted some explanations of how the city was flooded in their recent program "Storm that Drowned a City". 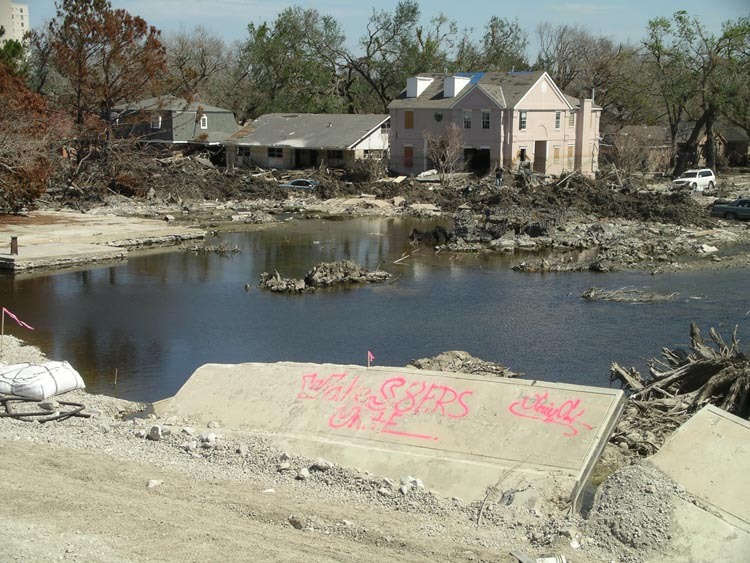 "Experts examine what went wrong and how New Orleans could be protected in the future." Once again the total incompetence of the Bush Administration in addressing the Katrina disaster is here for all to see. Don't forget this horrific family tale. Should it be rebuilt? Are the levee's ready for this years hurricane season? These images are awe-inspiring, gut-wrenching and thought-provoking. Excellent posts and photos, Stuart. My question is about the Port of New Orleans. 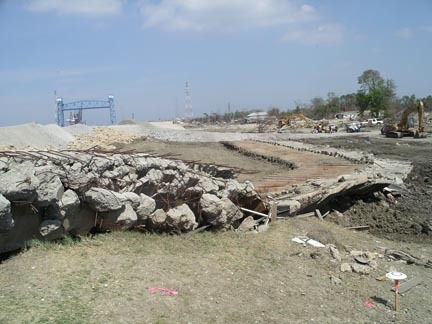 A visit to the Port's website disloses 11 ships in port, none over 10,000 tons. Is this normal? Any word about how close the port is to getting back up to 100%, and plans for that if any? Thanks for your pictures. I went down to New Orleans for the first time since Katrina last Thursday, and drove down to the lower 9th, lakeview, etc. I thought your pictures did a good job of capturing the devastation. I had to visit to really internalize the scope of the problem. We probably drove about 15 miles from the lower 9th through gentily past UNO to Lakeview and we could have taken pictures like yours almost anywhere along the drive. We stopped in the lower 9th along the levee away from the overflow / breaks. Sitting up on the grassy levee was surreal. There was almost no noise at all - we could have been out in the country but we were looking at destroyed homes as far as we could see. On the blocked we stopped, the former residents had dug out their damaged christmas decorations and decorated a tree at the foot of the levee and decorated their destroyed houses. Then we got to the French Quarter which was busy for New Years eve and had to drive around for about 20 minutes to find a parking space.